The huge outlier located 60 metres to the northeast of the stone alignment here at Ardamore. This megalith stands 2.9 metres high, is 2 metres wide and is over half a metre thick at the base. The northwest face of the stone, pictured left, is decorated with rock art motifs. Just above the centre of the stone is a cup with two circles and below this motif are a further two cups with a single ring. At the base of the stone there are two more cup and ring motifs with radial lines, only one of these two is highlighted in the image left. The stone also bears seven plain cup marks and a series of lines or grooves are incised into this face. The rock art makes this outlier even more impressive. 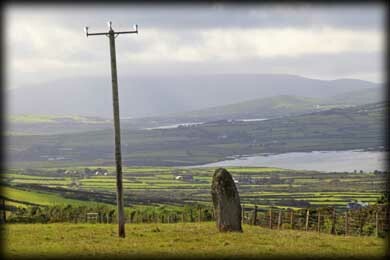 This townland is situated is the beautiful Lispole Valley, which is littered with ancient monuments. Sadly northwest of here a boulder burial was removed to make way for the trackway. Boulder burials have been found near or even inside some stone circles. 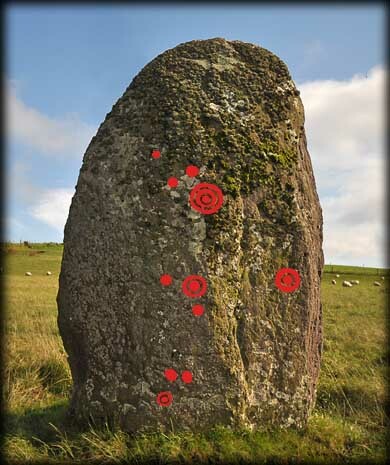 Some are associated with single standing stones or pairs of stones, but none have been discovered with a connection to a stone alignment. The field is quite boggy, boots are recommended. Situated: This huge megalith is located in the same field as Ardamore Stone Row. Discovery Map 70: Q 5224 0010. Last visit Sept 2012.